A south facing terrace with panoramic sea views over the bay of Saint Tropez. The house is situated on a hill and consists out of two floors. The entrance is located at the same level as the parking. On this floor are two bedrooms and the garage where the washing machine is. Via a staircase down you’ll reach the cozy living room with a modern comfortable sitting area, fireplace and large dining table. The living room has sliding doors with direct access to the terrace. The kitchen is also next to the terrace and has all amenities, 4 hobs, microwave, oven / grill, fridge freezer, dishwasher, toaster, kettle and coffeemaker. Also available is wireless Internet, DVD player, CD player and satellite TV with Dutch channels. In total there are 3 bedrooms; on the ground floor there is one bedroom with double bed (160x200) with an en-suite bathroom with a shower and sink. From this bedroom you can directly reach the terrace to the pool. The two other bedrooms are on the first floor, both with twin beds (2x90x200). On of the bedrooms also has an en suite bathroom (bath / shower) and shares this bathroom with the other bedroom. On this floor there is a separate toilet. The bedrooms are air conditioned and smoking is not permitted indoors. The spacious terrace with pool is easily accessible from both the living room, kitchen and bedroom. The kitchen provides access to the covered part of the terrace. Here is the outdoor kitchen with professional deluxe gas BBQ and a BBQ on coals and a dining table for 6 people. The south facing terrace has an excellent sun position. The swimming pool (kidney shaped) is approximately 9x4,5 meters with Roman steps and a pool alarm. Around the pool there is a large terrace with outdoor shower and 4 sun loungers. There is parking available for 2 cars on the fully fenced and secured area. Teak garden furniture is available. The outside terrace is also accessible from the parking lot. 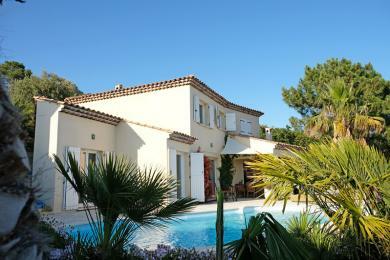 This villa is situated on a hill in Les Issambres. If you drive down by car you’ll arrive in the village within 5 minutes. This village is called San Peire and lies on the Cote d'Azur between St.Maxime and Frejus. From the airport in Nice and from Cannes you’ll normally arrive in San Peire within the hour. Within fifteen minutes you are in St Maxime. St Tropez is 45 minutes away (in summer also directly accessible by boat from Port San Peire!). Les Issambres / San Peire and Ste Maxime are known for their wide sandy beaches. If you like golf, you probably know that the Cote d'Azur has many beautiful golf courses available. Golf enthusiasts will enjoy the golf course of Roquebrune (15 minutes). * Prices are incl. VAT and excluding tourist tax (indication 2.00 p.p.p.n.). The exact costs of the service package will be shown as soon as the departure date has been selected by you and you have entered the travel party. In this villa, children of all ages are most welcome. Baby cot and high chair are for rent through the administrator. Pool: Private Pool size: 9 x 4.5 m.
Pool water treatment: Traditional pool chlorination Depth pool: 0,60 - 1.90 m.
Pool outdoor shower: Unknown Distance from villa to pool: 3 mtr.